Best Android tablets: which should you buy? The Huawei MediaPad M5 8.4 is a strong Android slate and the combination of its small size and metal shell makes it a real alternative to the iPad Mini 4. This has more than just good looks though, as the MediaPad M5 8.4 also has impressive stereo speakers, and coupled with its sharp 1600 x 2560 screen that ensures it lives up to its name as a media machine. It’s less good for gaming, and there’s no 3.5mm headphone port – so you probably will be relying on those internal speakers a lot, but if you want a very portable slate that’s great for movies and music then the Huawei MediaPad M5 8.4 is a top option. Topping our best cheap tablet list is the Huawei MediaPad M3 8 that falls in position five on our best Android tablet list thanks to an excellent screen, lots of power and its great value for money. It has a slim body with an aluminium frame that makes it look premium while also being practical too. 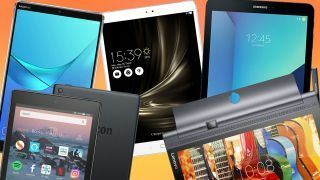 There's a sharp screen, it comes with speakers that offer impressive volume for a slim tablet and it's a lot cheaper than most of the other Android tablets on this list too. It's reading and web surfing-friendly, while the new 4:3 screen and general size and shape is better suited for most things. Videos work better on its predecessor thanks to its elongated aspect ratio - but they don't exactly look bad here. You can pick the Tab S2 up in 8-inch and 9.7-inch variants, to challenge Apple's iPad and iPad mini ranges, with the smaller option being more portable and cheaper. Almost impossibly thin, pumped full of power and with a slick version of Samsung's TouchWiz interface on board the Galaxy Tab S2 gives the iPad Pro 9.7 and Pixel C a real run for their money. This tablet will be particularly great if you have an Amazon Prime membership because it comes with a huge screen for watching movies and TV as well as reading ebooks. It's a cheap option that still packs such high-end specs including a 10-inch screen, but don't expect it to feature the best features on the market like some of the tablets at the top of the list. The Amazon Fire HD 8 (2018) is among the best of the retail giant's tablets, as while it's in many ways lower end than the similar HD 10, the smaller screen is sharper as a result, and the price is lower. What you do get is solid if not spectacular performance, and tight integration with Amazon’s other services through Fire OS, all at a price that’s well below most of the non-Amazon branded competition. You should also note that if you already own the 2016 or 2017 version of this tablet, it won't be worth upgrading to the 2018 version as the differences are minimal. Tablets don’t get any cheaper than this – well, functional ones don’t anyway. The incredibly low price and sturdy design make the Amazon Fire 7 (2017) a great choice to give to a kid – in fact, Amazon’s even built a (pricier) version specifically for children. Fire OS won’t suit everyone and this isn’t a tablet that impresses once you take the price out of the equation, but for what the Amazon Fire costs it would almost be rude not to buy it.